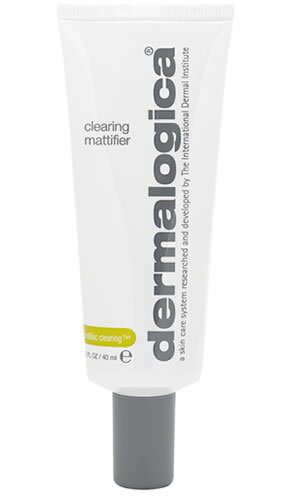 A medicated topical treatment that helps clear breakouts, reduce congestion and control shine. Silicones melt gently into skin to help diminish fine lines and smooth skin texture. Niacinamide, Zinc Gluconate, Yeast Extract, Caffeine and Biotin help to purify and inhibit overactive sebaceous activity while Salicylic Acid can clear congested follicles to minimize future breakouts. Contains no artificial fragrance or color. Silicones help smooth skin texture and diminish fine lines. A unique botanical blend helps regulate sebaceous secretions in skin, reducing oil and shine. Vitamin A helps increase skin elasticity while antioxidants of Grape Seed and Vitamin E condition and provide defense against skin- damaging free radicals. Retinyl Palmitate (Vitamin A): helps increase skin elasticity and helps reverse the signs of prematurely induced photoaging. Silicones: melt gently into skin to help diminish fine lines and smooth skin texture.